International Maritime Organization (IMO) fuel rules entering force in 2020 mandate a drastic sulfur reduction. By 2050 the mandate is to cut greenhouse gas emissions of shipping by at least 50 percent. Marine fuels, lubricants and additives manufacturers play their part in establishing maritime’s green credentials by introducing new environmentally acceptable technologies and products. The shipping industry is more than ever portrayed in a bad light due to increasing awareness of its contribution to global climate change, according to Dirk Kronmeijer, CEO of GoodFuels Marine. Kronemeijer is convinced that biofuels will play a significant role in drastically reducing the shipping industry’s impact on global emissions and that tugs and offshore support vessels (OSVs) are in a very good position to lead the industry by example because of their high visibility in coastal areas. Kronemeijer has said that the recently updated IMO standards for marine fuel sulfur content from 3.5 percent to 0.5 percent by 2020 is a significant step towards improving the fuels employed by the shipping sector and that, more importantly, this will bring into existence global emission control areas (ECAs), which previously were restricted to the North Sea and the U.S. coasts. In these ECAs, the world’s most polluting fuel, HFO, can no longer be used without the employment of scrubbers. Although carbon emissions are being excluded from international maritime regulations until 2023 (supposedly due to a lack of accurate emissions data), market players and local governments are pushing to bring the date for regulatory change forward. The legal limit on sulfur and the expected carbon regulation will dramatically affect the marine sector’s fuel consumption and heighten the applicability of low-carbon fuels. Such fuels have already penetrated the fuel mix for other parts of the marine industry, particularly in the Netherlands. Sustainable marine fuels add a competitive edge to companies servicing public operations, as clients demand these fuels in order to reduce their carbon footprint. GoodFuels Marine is active in the distribution of sustainable marine fuels and their adoption in the marketplace by presenting the case for companies employing ships (or any other machinery running on fossil fuels) to switch to a (partial) low-carbon fuel. By doing so, these companies can set an example for the future as well as benefit from increased chances of winning tenders, and portray themselves as sustainable companies. GoodFuels’ marine fuel is an easy-drop-in fuel that can be used without any adjustments to equipment or engines and, as such, is a zero-capex alternative to decarbonization. Kronemeijer said that regulation and incentives are essential for the broad adoption of low-carbon marine fuels to take place and that, as the IMO has agreed that a detailed carbon strategy will not be finalized until 2023, inclusion in the EU emissions trading system (ETS) will be an important first step towards establishing low-carbon shipping and send a clear signal to the IMO. 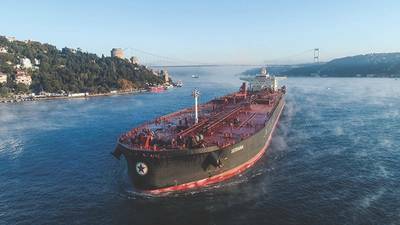 Shell Marine’s Global Technical Manager, Dr. Sara Lawrence, has said that the technical, commercial and regulatory variables in play when considering a shipowner’s optimum cylinder oil supply solution are continuing to rise. To overcome some of these challenges, the company last year introduced new two-stroke and four-stroke cylinder oils, opened a blending facility in Singapore, added new delivery ports, and introduced new technical services. An additional initiative from the company this year is its Marine Integrated Lubrication and Expert Solutions (MILES) development, which combines purchasing options, services and an extensive range of lubricant products in a multi-faceted strategy for customers to address their most pressing operational concerns. MILES includes new and different delivery options and a coherent response to digital disruption in the maritime sector, Lawrence said. It not only takes full advantage of digitalization, but is also a proposition that addresses the challenges shipowners face from regulators and new engine technology, new fuels and new efficiency pressures. She said that MILES not only provides optimal volumes/port liftings recommendations, but can also be evolved to offer entire lubrication management for a vessel, combining stock levels and demand planning that includes a vessel’s operating profile. At the start of 2017, the company’s Shell Alexia two-stroke cylinder oil portfolio covered fuel types from LNG to HSHFO, operating regimes from full load to slow steaming, and engines of all ages. It extended from Shell Alexia S3, a 25 BN oil for ECAs, Shell Alexia S4 (BN 60) and Shell Alexia 50 (BN 70) to the 100 BN Shell Alexia S6, which was developed to perform with HSHFO in conditions where oils are under extreme stress. Shell Marine introduced Shell Alexia 140 in 2017 to deliver added protection against cold corrosion for modern engines. The oil can be mixed with lower-BN oils to adjust base number as vessels move in and out of ECAs. The company has also secured a No Objection Letter (NOL) for use from MAN Diesel & Turbo, which also used the product as its first test oil for automated cylinder oil mixing (ACOM); Shell Alexia 140 has also been successfully used with Maersk Fluid Technology’s ‘blend-on-board’ technology. Lawrence said that the approach of the IMO 2020 meant that cylinder oil optimization to deal with changing fuel composition was continuing. Post 2020, both LNG and HSHFO will ‘have a place’, she stated, but owner decisions taken to date suggest that low-sulfur fuels will be the shipping industry’s mainstay. The M/T Seriana, a 110,000 dwt Japanese-built LR2 tanker operating in the Greek market under the management of Neda Maritime, began to experience severe corrosion in its MAN 6S60ME-C8.2 engine soon after its launch in 2015. Initially, a significantly higher than OEM-recommended feed rate of Chevron’s Taro Special HT 100 cylinder lubricant was implemented by the owners in an effort to keep the wear rate within acceptable limits. However, wear rates were unchanged and over-lubrication resulted in liner polishing. Understandably, Neda Maritime was concerned about the implications for the liner’s lifespan and, following numerous scavenging space inspections as well as repeated on-board scrape down measurement analysis, the company consulted Chevron’s technical specialists who recommended switching to a higher-BN cylinder lubricant, Taro Special HT Ultra, a 140 BN cylinder oil with high-performance lubrication properties. A high cylinder oil dosage, as well as being costly for operators, does not necessarily result in better engine operation, and the Chevron specialists instead analyzed the case with a focus on oil characteristics and chemistry. Initially the product was also used at a high feed rate before the feed began to be reduced following positive results from frequent drip oil testing using Chevron’s DOT.FAST service. Liner measurements from the M/T Seriana demonstrated that, within a period of about four months, the use of Taro Special HT Ultra had returned wear levels to normal. Ultimately, the feed rate was reduced by more than 30 percent and the overall engine condition was much improved. Through DOT.FAST drip oil monitoring Chevron demonstrated that switching to Taro Special HT Ultra provided both a positive technical outcome and gave cost savings of more than $20,000 a year for this vessel alone. ExxonMobil has introduced its Mobil SHC Aware HS (Hydraulic System) Series hydraulic oils formulated to offer excellent protection in challenging marine operating environments. The oils meet the U.S. Vessel General Permit2 (VGP) requirements for EALs, making them suitable for use in U.S. inland and coastal waters. ExxonMobil said the formulation of the new oils was designed to help offer a range of performance benefits, including protection across a wide temperature range, superior low-temperature start-up, high resistance to oxidation and thermal damage, and excellent shear stability, thus ensuring a long operating life. The Mobil SHC Aware HS Series oils have passed the Eaton-Vickers 35VQ25 pump test and also meet Denison HF-1, HF-2 and HF-6 specifications: according to ExxonMobil, these OEM approvals highlight the hydraulic performance of the lubricants. The lubricants are especially suited for use in hydraulic equipment where VGP compliance is required and are suitable for a wide range of marine applications, including in hydraulic winches, ramps, hatches, doors, cranes and pumps, and other deck equipment. The new lubricants will be sold alongside the company’s established Mobil SHC Aware H Series oils and will initially be offered throughout the U.S.
Total LubeMarine introduced its Talusia Optima product, a 100 BN cylinder lube oil designed specifically to facilitate fuel switching without the need to change lubricants when transiting both in and out of ECAs. The new oil also has increased neutralization capability in comparison to conventional 100 BN products and is also designed for use with all fuels with a sulfur content from zero to 3.5 percent. The company reports that it has completed more than 8,700 hours of sea trials and has received NOLs from Winterthur Gas & Diesel (WinGD), Japan Engine Corporation (JEC) and MAN Diesel & Turbo. Talusia Optima is now in use as a lubricant for engines across a variety of ship types and has had a number of successes in addressing difficult cold corrosion issues not previously resolved by existing market products. The new oil formulation is based on an innovative type of chemistry known as ashfree neutralizing molecules (ANM), which provides effective acid neutralization and cylinder cleanliness, and also has the potential to reduce feed rates, the company stated. Blue Ocean Solutions said that when the new IMO regulations come into effect on Jan 1, 2020, it is expected that ship operating costs will increase by at least 10 to 20 percent. A proposed solution is the use of emulsified fuel systems: Blue Ocean Solutions introduced its BOS Emulsified Fuel System (EFS) in 2011, and this has been proven, according to the company, to perform reliably and significantly reduce fuel consumption and emissions on containerships, tankers, bulkers and cruise ships. The return on in investment, in most cases, is less than a year, and fuel operating expenditure has been reduced by about 2 to 5 percent. In simple terms, an emulsified fuel is one in which water has been added to fuel oil in such a way that small particles of water are formed in the oil to produce a stable water-in-fuel emulsion. The main purposes of this are to improve combustion efficiency by achieving a better heat release rate and to reduce NOx emissions by cooling the combustion. The key success factor in emulsified fuel is the ability to produce and maintain the optimum water content of 10 percent as water-in-fuel particles in a size range of 2 to 8 microns. BOS has achieved this with its patented BOS Emulsifier, which, unlike other commercially available systems, has no moving, cavitating or vibrating parts. Installation of the system takes five to seven days and does not require dry-docking: the basic components of the system can be retrofitted while ships are alongside in port, transferring cargo or passengers, and is achieved in a simple, fully-automated operation. The 305-foot factory trawler F/V Golden Alaska, powered by twin MAK six-cylinder engines and having a large boiler to support its fishmeal-fish oil processor and hoteling galley for its 80-person factory and crew personnel, uses a Fitch Fuel Catalyst on the output of dual centrifuges to provide a clean fuel burn and substantial cost savings. The vessel is now in its fourth year of operation and achieves about 18 months of service from each new catalyst core it installs. The beneficial results of the clean burn can be easily seen when the cylinder heads are removed from the main engines for service: significantly cleaner piston crowns and a very clean and pronounced pattern from fuel injection are observed and, during operation, less smoke is emitted from the main engines and the boiler, indicating better oxygenation and cleaner, more complete burning cycles. According to the distributor of the Fitch Fuel Catalyst system, Power Fuel Savers, results from the Golden Alaska’s current fishing season are showing fuel savings on its boiler of about 130 gpd and of 340-475 gpd during operating days on its main engines compared to a baseline established in the B fishing season of 2014. Power Fuel Savers has confirmed that at least one major tug operator is now evaluating the Fitch technology for its fuel savings potential and other benefits. RSC Bio Solutions’ newest grease developed specifically for severe applications, RSC EnviroLogic Grease 2 WREP (Water Resistant Extreme Pressure), an environmentally acceptable lubricant, has been formulated to offer excellent water resistance and extreme-pressure performance. As an EAL, the product is compliant with the US EPA’s Vessel General Permit and the International Maritime Organization’s Polar Code. This blue Lithium Complex grease is formulated with polyalphaolefin (PAO) and hydrocarbon-related type base fluids; it meets or exceeds the performance requirements of a grease used on articulated tug barges; and it also qualifies as a wire rope grease. In addition, the new grease offers anti-wear performance; a broad operating temperature range from below freezing to 204°; good oxidation stability, pumpability and shear stability; and sealing properties that keep out water and debris. The product is highly suited as a ferrous and yellow metal corrosion protection agent, and also provides steel corrosion protection, as demonstrated by its Salt Fog (B117) Test pass mark after 1,000 hours of 10 out of 10 and its Humidity Cabinet Test pass mark after 1,500 hours of 10 out of 10. Developed to meet the needs of the marine industry, Lubriplate Lubricants Company’s LUBRIPLATE BIOBASED EP-2 grease is an environmentally acceptable lubricant (EAL) that meets US EPA 2013 Vessel General Permit (VGP) requirements; passes the US EPA Static Sheen Test (1617); and passes US EPA Acute Toxicity Test LC50. The product is classed as Ultimately Biodegradable (Pw1) and is designed to protect slow- to medium-speed bearings, articulated tug barges (ATB) notch interfaces, rudder shafts, wire rope, above-deck equipment, port equipment, cranes, barges, oil platforms, and water treatment and hydroelectric facilities. The grease has high-performance extreme-pressure/anti-wear properties and is highly resistant to both fresh and salt water. The product is available in cartridges and 120 lb drums.